If you're a designer or shop owner, you may be finalizing last-minute graphics that you hope will totally wow your potential customers and make hem decide that they eed to purchase our products/services ver the countless others on sale this upcoming weekend. Aside from ah-mazing products and services (which I know you have to offer) and charming copy - photos are what will really sell your designs. They're what is going to help your potential customer envision your product in their life, and feel confident in the quality even before they receive that holiday cheer filled package in the mail. My not-so-secret weapon? SC Stockshop styled stock photos. And lucky us - they're on sale through Friday! coupon code: STOCKUP40 for 40% off! I truly believe that my Black Friday Weekend sales have been so successful over the past few years because of the beautiful SC Stockshop photos I used to showcase them in my shop, in the banners on my home page, in my newsletter emails, and on social media. It's no secret that I love Shay's photos, I talk about them all the time! But today, I want to share my top tips for using styled stock photos for shop owners with you, so that you can love using them just as much as I do! Shay is having a HUGE 40% off sale in her shop Friday, November 24 at midnight with code STOCKUP40 at checkout. She only has this sale twice a year, and one the images in her shop sell out, she won't be adding them back in! So if you see some pretties that would be perfect for your brand and shop, make sure to snag them today! This one might seem like a given, but it is oh so important! Shay has such a variety of gorgeous images in the SC Stockshop, all with unique personalities and color palettes. While I might love some of her blue-hued images, I always stick to photos that have primarily pinks, greens, golds, black and white to stay on brand! I believe that your imagery should always be as consistent as possible - especially the photos you use on social media. Your instagram feed should look like it is a direct extension of your website and shop, so using photos with props in your color palette is key! There's hardly a better compliment to receive than, "I knew that was your photo before even seeing your username - your images are always so recognizable!" That my friends is brand awareness at its best, and using cohesive color palettes with your styled stock images is a great way to start! One of my favorite features of Shay's photos is their high quality. The resolution of her images is so crisp, which allows you to zoom in and use portions of one image at a tighter crop - which is perfect for detail photos of your shop products! Zooming in and cropping the use of one photo in different spots of the image allows you to also get more for your money, as you are technically getting multiple images from one overall photo! Shay styles her photos so strategically with beautifully placed props throughout the image, so often you can get up to five different cropped sections depending on the layout! I clearly love this image - and used it consistently throughout my holiday designs! 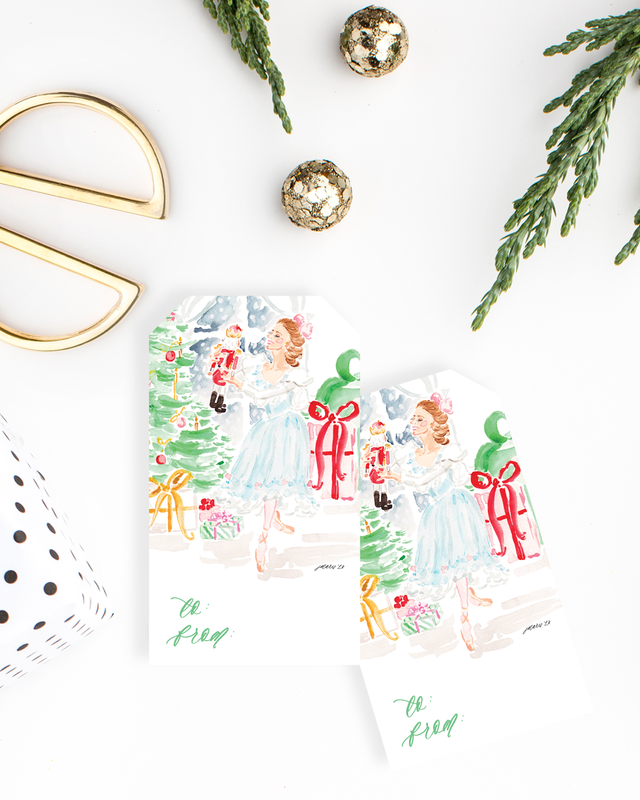 The full vertical image was perfect for my Nutcracker Watercolor Gift Tags Variety Set (which will be coming to the Lifestyle Shop on Black Friday! ), to showcase all five designs in one image. I then zoomed in and used just the cropped upper left corner of the image for my Nutcracker and Clara Gift Tags Set, and used the middle right section of the image for my Nutcracker Gift Tags Set! When determining which portion of an image to use for which products - think through the aesthetic that best matches the story of that particular product. For instance, my Clara design is much more delicate and feminine, so I wanted to use primarily dainty props in this image, focusing on the golds, hints of greens, and lots of white. 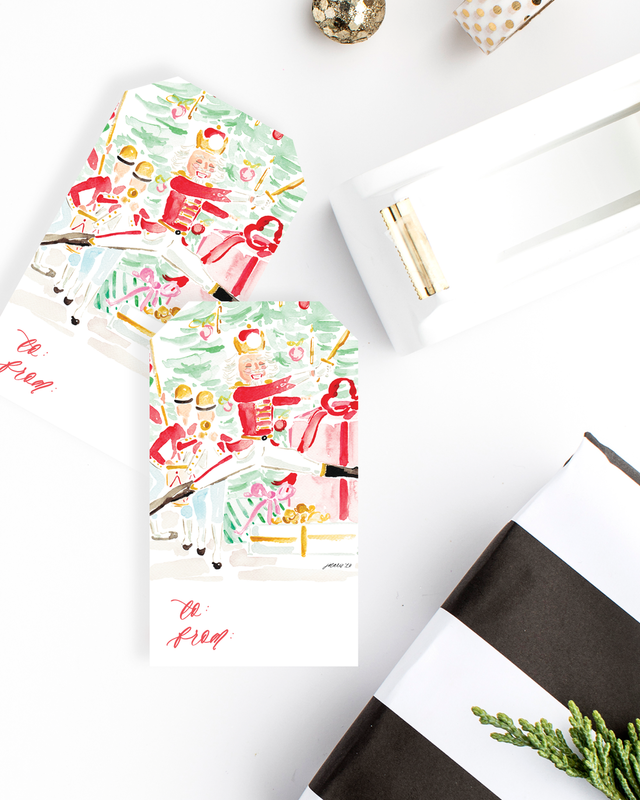 The Nutcracker design is much more vibrant and has a slightly more masculine undertone to it, so the bold black and white gift wrap portion of the design balanced with softer whites and golds was ideal to visually tell the story of his character! While Shay's images are gorgeous, it is important to know how to use them with your designs to make your end result images look realistic! One of my favorite tips for doing so is to layer your designs and use angles. Stacking gift tags on top of one another, or stacking a greeting card on top of an envelope, adds depth and interest to your photo. It is one of the best ways in my opinion to make your images pop and look lifelike! It takes the "flatness" out of a flat lay, and helps to tell the story of your product better. When a potential customer sees your greeting card stacked on top of an envelope next to a pen and some washi tape - it helps them to visualize how they would use your card to write a letter to a loved one, write their name on the front of the envelope, and then seal the flap of the envelope with some festive washi tape! The same goes for the gift tags. Stacking them on top of one another (especially using a couple of different designs) like the Nutcracker and Sugar Plum Fairy near scissors and ornaments will help them visualize wrapping their gifts, adding the tags as the final touch - making sure to select the perfect design for each individual loved one - and tucking the gifts under their tree adorned with ornaments. Using angles when orienting your designs layered on top of one another is just the icing on top of the cake when it comes to adding interest and a lifelike nature! In real life if you are writing a holiday card or wrapping gifts, everything won't be picture perfect and straight. So, you don't want to have everything at a perfect upright or horizontal angle in your imagery, either! One or two pieces can be perfectly straight (like my Dancing Snowflake Ballerinas Holiday Card and Clara Art Print), but the surrounding details should have some sort of an angle to them. Make sure that the angles make sense - for instance the envelope is oriented in a way that makes it fit perfectly tucked between the washi tape, pen, and ornaments. Using a variety of angles throughout your image, switching them up from left oriented to right oriented, will create an even more realistic design. Once you have layered your designs and added angles to certain elements, it is important to follow that up by adding drop shadows to your products! Drop shadows are the little shadows you see underneath my Sugar Plum Fairy Christmas Card and blush envelope. Without these shadows, the products would look flat and lifeless - and would blend into the white background of the desktop. Adding the drop shadows gives them more dimension, and helps them to fit into the image better! But, you don't just want to add a drop shadow that is from the preset of Illustrator or Photoshop. You want to ensure that the angle and spread/blur of the shadow matches the other shadows in the styled stock image! So for instance, when looking at the washi tape and the gift boxes in this image, I can see that the shadow is extending out to the left and down toward the bottom of the image. So, I mimicked that with the drop shadows I created! It is much easier to explain using drop shadows visually - so take a peek at the video tutorial above for my exact steps about how to use them! Remember back in Tip #1 when I shared the importance of your Instagram feed looking like a direct extension of your website and brand? Well, here's a snapshot of mine from last holiday season! All of the images either use my brand colors - blush, peony pink, fuchsia, magnolia green, and pops of black, white and gold - or tell the story of what I do - custom watercolor paintings, brush calligraphy, and wedding stationery. How do I achieve a good balance of those colors and visual storytelling? By integrating and mixing styled stock images with iPhone images and professional images! Having a mixture of a few different types of images throughout your feed creates interest. If you were to use 100% styled stock images in your feed, it would definitely be gorgeous, but would start to get pretty repetitive unless you owned all of Shay's images! In order to make sure that your styled stock images blend in realistically with your overall feed, sprinkling them in between other photos breaks up the repetition and encourages your followers to look at all of your images individually! For instance, I used a lot of Shay's styled stock photos last year with my holiday launch and sales. More so than I normally do in non-holiday, launch, or sale weeks - because I wanted the focus of my Instagram to be about the new products, giveaways, and sale! However, to make sure I was not being too repetitive, I sprinkled in an image from one of my November bride's weddings (Thanks Jessa from Love & Light Photographs!!) to celebrate their recent wedding, an image of a tablescape design from The School of Styling to celebrate Thanksgiving (Thanks Shay from Love The Nelsons! ), and an image of me meeting the sweet Cami Monet at Remedy Coffee (I strategically wore a black and white striped top to match my Insta feed, and it just so happened that she was wearing one too, so we blended perfectly in with my brand aesthetic!). I also made sure to switch up the different types of styled stock photos I shared - making sure not to share the same image twice in a row. Using different layflat desktop images, upright desk images, and frame images together makes it a bit less obvious that you are using a styled stock image, yet again making the designs and images appear more lifelike in your feed! GRAB YOUR FAV STYLED STOCK PHOTOS! I hope these top five tips for using SC Stockshop photos for your online shop have been helpful!! If you have any other questions about how I use Shay's photos to elevate my brand, shop, and social media, let me know! I'll either answer your question in the comments below, or do a video tutorial or another blog post if the question is more in-depth! Thank you so much Shay for providing such incredible images for us to use, and to allow us to do business beautifully, as you would say!